Nevion will be showcasing how its IP-based solutions for contribution, facilities, remote production and digital terrestrial TV (DTT) can enable broadcasters to ‘connect better, share better and broadcast better’ at IBC 2017. This year’s IBC show will see Nevion announcing and demonstrating a range of new features delivered as software updates for its flagship products, VideoIPath management orchestration software and Virtuoso, the software-defined media node platform. These updates are designed to deliver the convergence required by broadcasters as IP blurs the distinction between the local area networks (LANs) being deployed in their facilities and wide area networks (WANs) used for contribution, remote production and distribution. The new release of the VideoIPath software will extend further the existing WAN-based media software-defined network (SDN) capabilities into the LANs. Some of the highlights of the new release are the new Flow app and the Panel app, which provide advanced workflow connectivity within facilities. 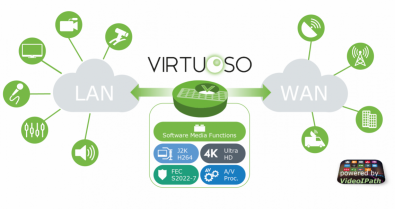 Nevion Virtuoso’s latest software upgrade adds studio-over-IP functionality to its existing WAN capabilities, including support for the SMPTE 2110-30 (audio over IP) standard. It will also extend its support for 4K transport with TICO encoding. Nevion will also be showing the latest developments across its product range, including Flashlink (optical transport), Media Gateways and Ventura (encoding and transport), nSure (monitoring), cProcessor (TS processing) and VikinX (baseband and IP switches).